Death hurts but I loved this thought: “Souls still know us, love us, and love to hear from us” (through prayers directed to God). We must never lose sight of the fact that we are souls first and bodies second. We are a soul with a body not a body with a soul. Incidentally my church Lifecentral spoke on this very topic a few weeks ago. The author recognises that there are five stages of grief: denial; anger; bargaining; depression and acceptance. Grief does not necessarily start at death but at diagnosis. It is important not to journey alone. We need friends, family and support systems. We need to pray for each other. Survivors of cancer must get regular check-ups. They realise that “our confrontation with cancer will always be a part of our story.” Survivors are well placed to walk alongside others battling cancer to provide empathy and support. After each of the three sections there are questions, exercises and resources designed to help us in our individual walks. Throughout the book there is much scripture and also quotes from individuals such as C.S. Lewis and Viktor Frankl who was a concentration camp survivor. 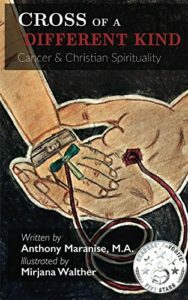 Cross Of A Different Kind is a powerful resource for all those of us whose lives have been touched by cancer. The statistics of one in two of our lives being touched by cancer is frightening (as quoted on The Great British Bake Off Stand Up To Cancer). The book can be dipped in and out of or like me you may want to read cover to cover. Thank you Anthony Maranise for writing such a powerful book. May God richly bless you and may you continue to be cancer free.